Observations of the Perseus and Virgo galaxy clusters suggest turbulence may be preventing hot gas there from cooling, addressing a long-standing question of why galaxy clusters do not form large numbers of stars. 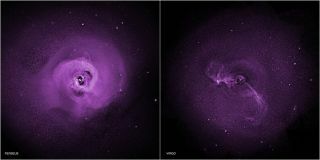 NASA's Chandra X-ray Observatory captured these views of the clusters. The low birth rate for stars in distant galaxy clusters is one of astronomy's long-standing mysteries. But scientists now have a new culprit in the case: cosmic turbulence from black holes. The discovery, made by astronomers using NASA's Chandra X-Ray Observatory, suggests that black holes make it hard for new stars to form in gas-rich galaxy clusters. It may also explain why more infant stars aren’t present in these otherwise fertile areas, researchers said. Zhuravleva's team used the Chandra X-ray Observatory to study the Virgo and Perseus galaxy clusters, which are brimming with thousands of galaxies and even more stars. The Virgo galaxy cluster alone contains about 2,000 galaxies — the largest of which contain roughly 1 trillion stars. But despite their sheer size, the most massive element of the galactic clusters are the gas that lives in the spaces between galaxies. Over time, these gas clouds should naturally cool down and become prime areas of star formation. But in most galaxies, the gas is hotter than predicted. Since this hot gas can't coalesce into stars, star births remain low, researchers said. Turbulence­­ usually refers to chaotic changes in the pressure and speed of a material. A fast moving ship, for example, can create turbulence on an otherwise calm body of water. In the interstellar gas clouds, the turbulence is believed to originate with supermassive black holes, which spit out violent jets of matter. The jets carve out deep cavities in the gas and generate strong turbulence, which gets passed into the gas cloud surrounding the cavity. Turbulence in galaxy cluster gas clouds could come from other major events, like two galaxies merging together. But the researchers believe black hole ejections are the most common source of the turbulence that ultimately hinders star birth.